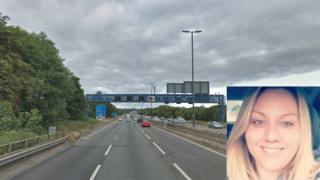 A woman who died after reportedly driving the wrong way on the M4 will be "truly missed," her family has said. Georgina Coombs, 38, from Cwmbran, Torfaen, died at the scene of the crash between junctions 26 and 27 in Newport. Gwent Police said her silver Vauxhall Astra was "reported to be driving in the wrong direction" when it collided with a black BMW on Friday night. Her family said Ms Coombs had two children and her death had left a "huge hole" in the lives of her loved ones. Their tribute added: "Gina will be truly missed by everyone who knew her." A 21-year-old man from Blackwood, Caerphilly county, who was in the BMW, is still in hospital but his injuries are not thought to be life threatening.